"Possibilites," a memoir of Herbie Hancock. In the book, written with Lisa Dickey, he describes his constantly evolving career: as a child prodigy playing classical musical, a sideman in Davis' legendary mid-1960s quintet, and as a bandleader who went from far-out jazz-fusion with his Mwandishi band, to funk with the Headhunters, to hip-hop on the album “Future Shock” and beyond. NEW YORK (AP) — Herbie Hancock doesn't begin or end his newly published memoir "Possibilities" by recalling any of the many highlights in his 50-plus-year career such as receiving the 2008 Album of the Year Grammy Award for "River: The Joni Letters." Instead, the 74-year-old pianist bookends his life story by recalling a concert with Miles Davis' quintet nearly 50 years ago in Stockholm, Sweden, when he played what he thought was a wrong chord. The trumpeter quickly played some notes that made the chord sound right and unleashed a solo that took the song in a new direction. That night the young pianist learned an important lesson. "We all have a natural human tendency to take the safe route — to do the thing we know will work — rather than taking a chance," Hancock wrote. "But that's the antithesis of jazz, which is all about being in the present ... It's about trusting yourself to respond on the fly. If you can allow yourself to do that, you never stop exploring, you never stop learning, in music or life." 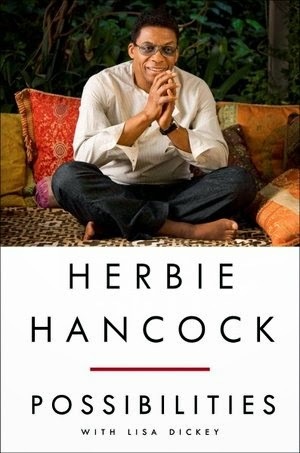 In "Possibilities," written with Lisa Dickey, Hancock describes his constantly evolving career: as a child prodigy playing classical musical, a sideman in Davis' legendary mid-1960s quintet, and as a bandleader who went from far-out jazz-fusion with his Mwandishi band, to funk with the Headhunters, to hip-hop on the album "Future Shock" and beyond. Hancock reveals for the first time in the book his crack cocaine addiction in the late '90s. He credits his family and his Buddhist faith with helping him overcome "the biggest obstacle I ever faced." Hancock spoke recently to The Associated Press by telephone from his Los Angeles home. Associated Press: What message are you trying to convey in "Possibilities"? Hancock: The outlook toward having a life that's open to possibilities has worked for me even during my darkest hours. The reason that I write about my drug addiction is because I realized that I could possibly turn those dark days into something positive for others — to show that if I was able to overcome that, you can do it too. ... You have the power to create a life that is constantly moving forward and develop the courage to fight the daily battles against the negative part of yourself. AP: In the book you describe Miles Davis as your "musical mentor." How did he inspire you? Hancock: What I loved was that Miles told us that he paid us to work on things — not to just perfect something in our hotel room and play that just to get applause from the audience. He wanted us to constantly work on new things. He stimulated creativity. He could sense when we had gotten to some point where we had to break the rules in order to go outside the box. AP: Another major influence cited in the book is Buddhism, which you began practicing in 1972. How has Buddhism influenced your approach to music and life? Hancock: One of the most important realizations I had through practicing Buddhism is that the core of my life is not being a musician, it's being a human being. Being a musician is one of the aspects of my life. I'm also a father, husband and a citizen. ... Coming from the perspective of me being a human being first is what opened up for me an exciting perspective of using music to show the great value of the diversity of cultures that exist in the world and how to incorporate different styles of music, combining forces to create something none of us could create alone. AP: When you formed the Headhunters band in 1973, jazz purists accused you of selling out. What motivated you to create Headhunters? Hancock: When Sly Stone did "Thank You (Falettinme Be Mice Elf Agin)" that became one of my favorites. Even though I had this avant-garde band, Mwandishi, I was listening to James Brown and Sly Stone. I was brought up on the South Side of Chicago, which is a blues town. I heard Muddy Waters when I was a kid. For me to do a record like "Headhunters" is going back to my roots. I was tired of doing music that was untethered. I had this inner need at that point to do something that was earthier. I was taking a risk because I might not get a new audience and might alienate the one I already had, but I knew I had to be true to myself.